I also face this issue. I logged an issue on a Realm repo. kanvuduc's solution fixed my problem and saved my bacon!!! And now moved to jbevain/cecil#378 as Mono group is pointing to Cecil as the cause. And now Cecil is pointing to Fody again jbevain/cecil#378 (comment). Is Fody using v0.9 or v.10 ? So I checked the latest nuget packages for Fody. 1.29.4 en 1.30.0-beta01 are coming with Mono.Cecil.dll version 0.9.6.0; so this is the problem (according to Mono.Cecil). Is it possible to create a new update for fody packaging this latest version? @SimonCropp ? Any idea for workaround in Visual Studio on Windows? On Apr 11, 2017, at 2:49 PM, Jan Škrášek ***@***. ***> wrote: Any idea for workaround in Visual Studio on Windows? — You are receiving this because you commented. Reply to this email directly, view it on GitHub <#302 (comment)>, or mute the thread <https://github.com/notifications/unsubscribe-auth/ATWKVOslmnmOIaNAQFT73QDkFujLHF1xks5ru9k1gaJpZM4M37HA>. Well, on Windows, there is not such configuration, is there a mono somewhere? @Lenndev nobody is "pointing", people just try to find the cause and get it logged into a proper issue tracker. It seems like this is causing major havoc for a lot of dev's... so glad it's not just me. It seems that the root of this is Cecil, however it is also a Fody problem due to the way in which Fody ships with no dependencies by including Cecil as part of the package. Supposedly the issue should be fixed in 0.10-beta5, however Fody would need to release an updated package with the new Cecil binaries. 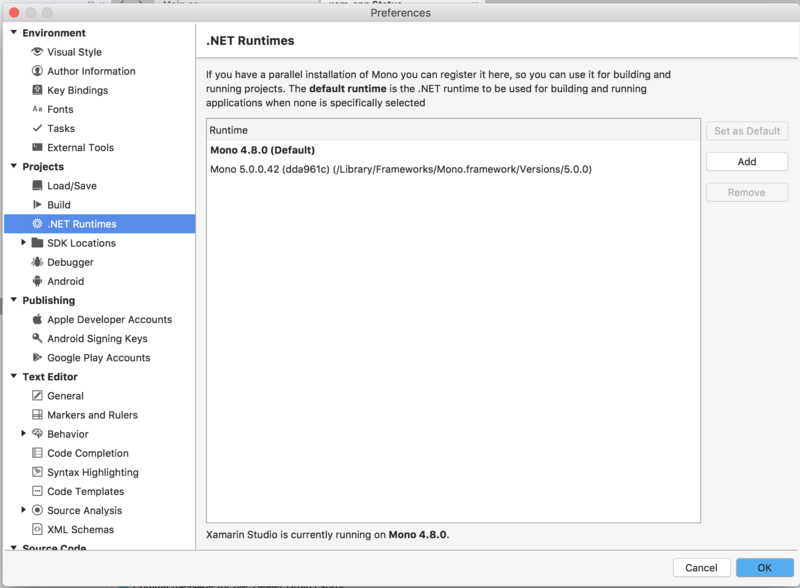 This is going to break any Xamarin dev using Fody very soon. It looks unfortunately like this project is a bit dead. I took a quick look at merging in the upstream Cecil changes back into Fody's fork, and it looks like maybe Cecil now includes the functionality Fody had added to their fork, so perhaps it's possible to use Cecil as a true dependency. I may have an extended look at this over the next few days. This is going to break any Xamarin dev using Fody very soon. Yup, add one more to the list. Sadly, like @kanvuduc mentioned, this breaks the usage of Realm. We were about to start using it in a new app, but now we have to find something else. Any recommendations besides sqllite? @SimonCropp testing this with PropertyChanged in VS for Mac everything looks like it's working right again. Thanks for getting the update out! @kanvuduc how can I download 4.8.0 for mac?